Arms sales of the world’s 100 largest arms-producing and military services companies (the SIPRI Top 100) totalled $374.8 billion in 2016, which represents a 1.9 per cent increase compared with 2015. 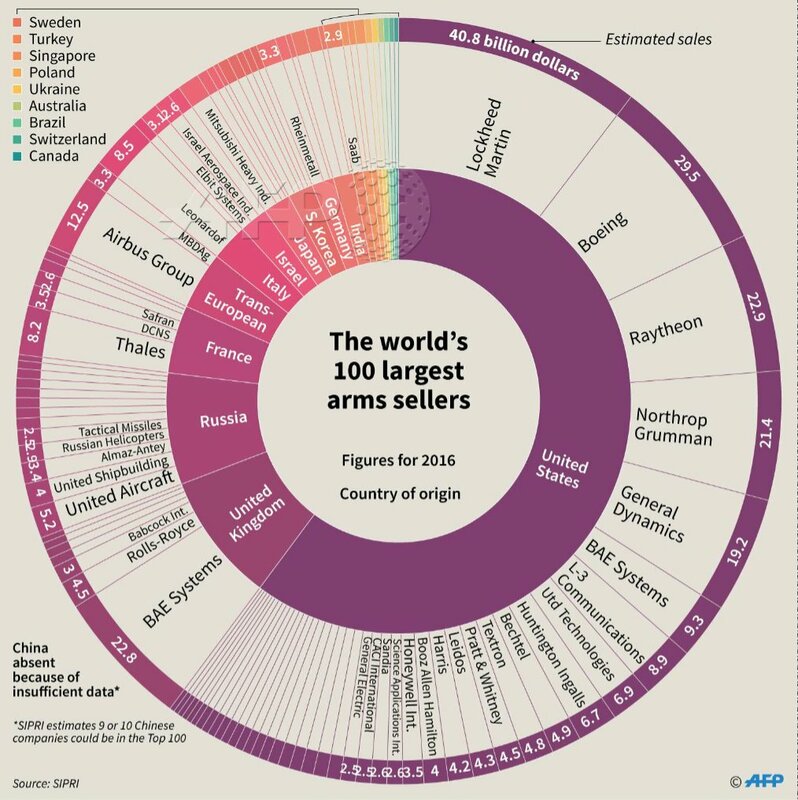 The chart above (available here) shows the Top 100 for 2016, as stated by SIPRI in a recent publication, with data from the updated SIPRI Arms Industry Database. It describes the trends in international arms sales that are revealed by the new data. Arms sales by US-based companies in the Top 100 rose by 4.0 per cent to $217.2 billion in 2016. With 38 companies ranked in the Top 100 for 2016, the USA accounted for 57.9 per cent of the total Top 100 arms sales. Sales of West European arms producers in the Top 100 were mostly stable in 2016. Their combined arms sales totalled $91.6 billion, with an increase of 0.2 per cent compared with 2015.
arms sales by 20.6 per cent to $8.4 billion in 2016.